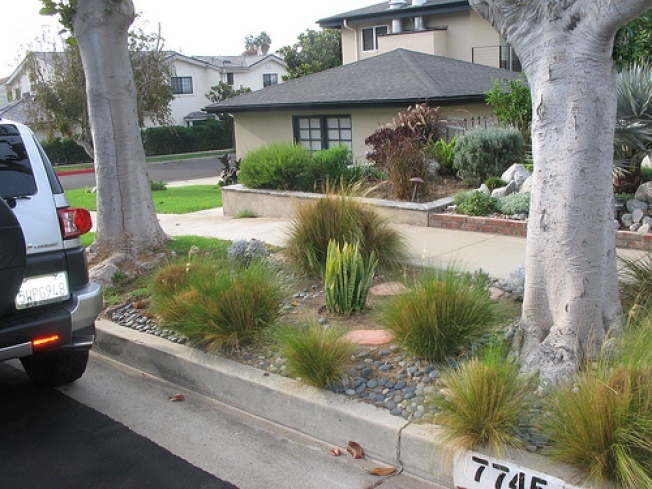 Drought-resistant on parkway tree lawns like this at the Playa del Rey home of Alan and Sandy Krieger are being cited as illegal by city inspectors. You gotta love L.A. -- what other town would send officials to cite people in the middle of a drought for planting drought-resistant plants to save water. Even as Mayor Antonio Villaraigosa and state officials are warning of severe water shortages as reservoirs are near historic lows and a dry winter is forecast, inspectors with the Pubic Works Department are citing residents for planting cactus and succulent plants on their parkway tree lawn areas, the city-owned between the street and the sidewalk. "We are going through one of the worse droughts in history, the Mayors Office is urging people to cut back on watering, and to landscape w/drought tolerant plants -- what a contradiction in terms...This is an outrage," Playa del Rey resident Alan Krieger wrote in a letter to Councilman Bill Rosendahl's office Thursday. That's the same day that water allotments to the Metropolitan Water District were cut to the 15 percent level over fears that rationing might become necessary. It was also after Krieger and his wife Sandy faced a supervisor and two Public Workers inspectors over the citation they were given ordered to immediately remove their drought-resistant plants and replace them with grass or pavement or leave the parkway as dirt -- or face prosecution. "They didn't really care," Alan Krieger said today in a phone interview. "It seems all government agencies just can't work together." Given the uneven enforcement of so many laws by the city, it seems astounding that zealous officials would choose to go after this one. But there's lot of people to cite -- 25 within a few blocks of the Kriegers. Rosendahl aide Jim Kennedy is looking into the problem. Public Affairs spokespeople were unaware of what is going but also are looking into it. The Kriegers say Inspector Ron Henderson came to their house in early September and told them the cactus, succulents and rocks in their parkway violated the law. A week later he cited them and gave them 30 days to comply but that wasn't good enough for Inspector Joanne Frampton who ordered them to comply "at once." "Non- negotiable and, she claimed to supersede Ron's authority. So, we complied by removing the rocks, and left the "stones" which prevent the dirt from running off the curb when watering," the letter to Rosendahl's office says. That's what led to the administrative hearing Wednesday.where they were threatened with fines and criminal prosecution. Don't you love L.A., too?